The Merlin (Falco columbarius) is a compact, small falcons that nest circumpolar in the northern hemisphere and is the smallest falcon in Europe. The species has a northern circumpolar distribution and breeds in Iceland, British Isles, Scandinavia, Baltic States, northern Asia and North America. Most of the world population are migrants. The Merlin often nests in abandoned nests by corvids or pigeons. The Merlin hunts mainly birds, but sometimes rodents and insects. The Merlin can take its prey in the air and on the ground. The Merlin likes to sit on a slightly elevated location looking for prey. TAGS: Bird painting of Merlin, bird sketch of Merlin, bird drawing of Merlin, bird art of Merlin, bird illustration of Merlin. The Red-tailed Hawk (Buteo jamaicensis) is a bird of prey one of three species colloquially known in the United States as the "chickenhawk," though it rarely preys on standard sized chickens. It breeds throughout most of North America, from western Alaska and northern Canada to as far south as Panama and the West Indies, and is one of the most common buteos in North America. 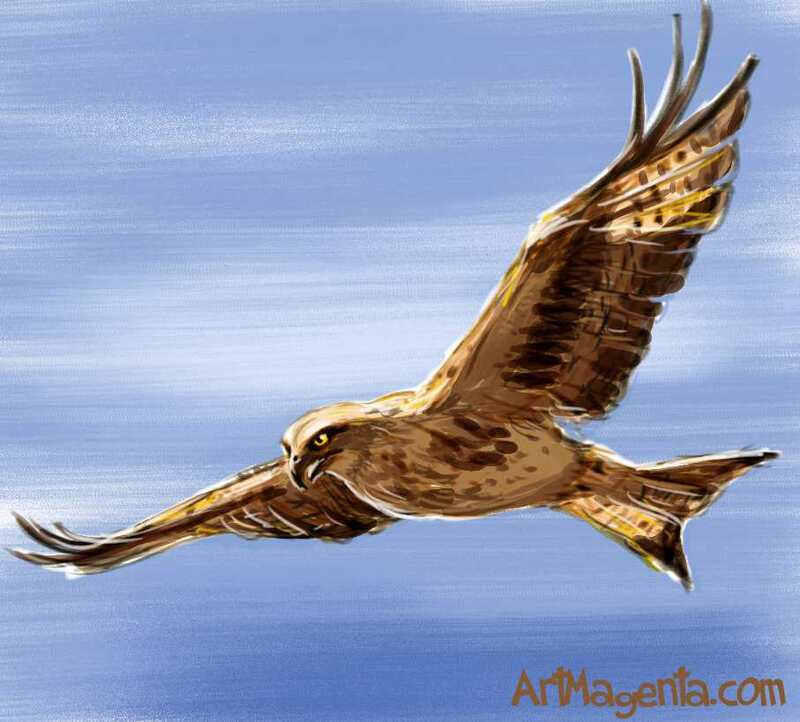 TAGS: Bird painting of Redtailed Hawk, bird sketch of Redtailed Hawk, bird drawing of Redtailed Hawk, bird art of Redtailed Hawk, bird illustration of Redtailed Hawk. The American kestrel (Falco sparverius) is the smallest and most common falcon in North America. It also ranges to South America, and is a well-established species that has evolved seventeen subspecies adapted to different environments and habitats throughout the Americas. The Kestrel is Belgium's National Bird. The Common Kestrel (Falco tinnunculus) is a bird of prey. This falcon is widespread in Europe, Asia, and Africa. 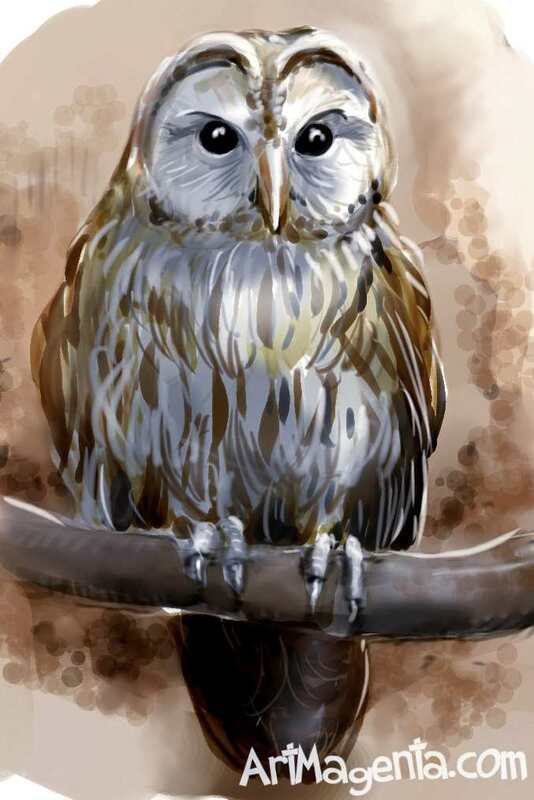 TAGS: Bird painting of Common Kestrel, bird sketch of Common Kestrel, bird drawing of Common Kestrel, bird art of Common Kestrel, bird illustration of Common Kestrel. Crested caracara (Caracara cheriway) is a resident in Cuba, northern South America (south to northern Peru and northern Amazonian Brazil) and most of Central America and Mexico, just reaching the southernmost parts of the United States, including Florida, where it is resident but listed as threatened. TAGS: Bird painting of Crested caracara, bird sketch of Crested caracara, bird drawing of Crested caracara, bird art of Crested caracara, bird illustration of Crested caracara. Secretarybird (Sagittarius serpentarius) is found in Africa from the region directly south of the Sahara to South Africa. Most individuals are living in the savanna.